Turn RIGHT onto US 17, which is South. Go exactly 1 mile and TURN LEFT onto Big Mill Road. Go 1/2 mile and the B&B is on the LEFT. It is a gray brick house, ivy espaliered on the side, white fence in the field just before the house. Sign is on the lamppost. If you see two large lakes, you have just missed the B&B. Address is 1607 Big Mill Road. At Rocky Mount from I-95 take US Highway 64 EAST for 50 miles. Take the 2nd Williamston exit  Exit 514 (this is the intersection of US 64 and US Highway 17). Take US 64 West and go about 85 miles to Jamesville. Continue on US 64 and in several miles you will cross Gardner’s Creek Bridge. Go 4.5 miles and turn LEFT onto Reddick’s Grove Church Road (just before this turn you will see a sign in the median for October Lane). You can see a block church just to the left (although this isn’t Reddick’s Grove Church!). Go about a mile and you will come to a flashing light. Continue STRAIGHT and road becomes Big Mill Road. Go about 1 mile and Big Mill B&B will be on your right. You will pass two large lakes and Big Mill is just beyond the lakes. The next road to the left will be Holly Springs Church Road. Turn LEFT onto this road. Go about a mile and you will come to a flashing light. Turn RIGHT onto Big Mill Road. Take Interstate 95 to US 64 (at Rocky Mount). Take US Highway 64 East for approximately 50 miles. Take the 2nd Williamston exit – Exit 514. This is the intersection of US 64 and US Highway 17. Follow US Highway 17 South for approximately 100 miles. About 1 mile past the Roanoke River Bridge you will be on the new bypass. Take Williamston EXIT #514 and go SOUTH on US 17 (which will be a right turn after you make exit). Continue on US 17 for exactly 1 mile and turn LEFT onto Big Mill Road. Go 1/2 mile and Big Mill Bed & Breakfast is on the LEFT. There is a field before it, a white fence, ivy espaliered on the side of the house (this is lit at night) and the house is gray painted brick. The sign is on the lamppost. Just beyond the house are two large lakes that come up to the road… If you see these lakes, then you just missed us! From the intersection of Highways 264 and 13 you will head NORTH on US Highway 13. You will pass a large pharmaceutical facility on the right, it keeps changing names. You will be paralleling a railroad track. Be looking for the signs for Stokes and Bear Grass. Just past the pharmaceutical facility turn RIGHT onto Highway 903. (You will be heading toward Stokes). Stay on Highway 903 for about 7 miles and go through Stokes. Just after Stokes, (at the purple store), Highway 903 turns to the left, but you STAY STRAIGHT, heading toward Bear Grass. Do not turn at the purple store. Continue on through the country for about 5 miles or more, curving around and go through the small town of Bear Grass. There is a statue of a rearing bear in front of the school. Go through Bear Grass and continue on a few miles more until you must stop at a stop sign at US Highway 17. (Four-lane highway) Turn RIGHT onto US Highway 17, which is south and go 1-1/2 miles. Turn LEFT onto Big Mill Road which is the 1st paved road to the left. GO 1/2 mile and Big Mill is on the left. It is gray painted brick, ivy is espaliered on the side, white fence just before and the sign is on the lamppost. If you see two large lakes, you just missed it! 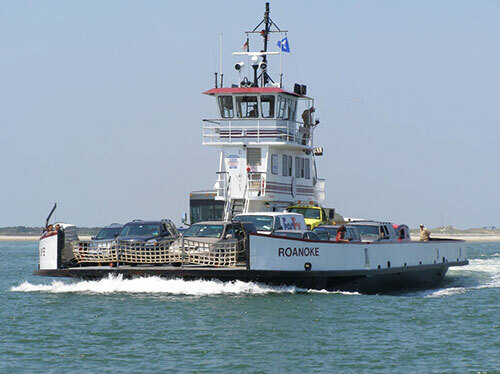 Catching the Outer Banks Ferry to Ocracoke? Stay at Big Mill Bed and Breakfast the night before. We’re just an hour from the Swan Quarter Ferry to Ocracoke. After lodging and breakfast at Big Mill, you’ll have plenty of time to make the ferry. Download the OBX ferry schedule (PDF). We're also an easy drive to Nags Head, Corolla and the Outer Banks via US 64.